"Hieroglyphics" redirects here. For other uses, see Hieroglyph (disambiguation). Egyptian hieroglyphs (/ˈhaɪrəˌɡlɪf, -roʊ-/) were the formal writing system used in Ancient Egypt. Hieroglyphs combined logographic, syllabic and alphabetic elements, with a total of some 1,000 distinct characters.Cursive hieroglyphs were used for religious literature on papyrus and wood. The later hieratic and demotic Egyptian scripts were derived from hieroglyphic writing, as was the Proto-Siniatic script that later evolved into the Phoenician alphabet. Through the Phoenician alphabet's major child systems, the Greek and Aramaic scripts, the Egyptian hieroglyphic script is ancestral to the majority of scripts in modern use, most prominently the Latin and Cyrillic scripts (through Greek) and the Arabic script and Brahmic family of scripts (through Aramaic). The use of hieroglyphic writing arose from proto-literate symbol systems in the Early Bronze Age, around the 32nd century BC (Naqada III), with the first decipherable sentence written in the Egyptian language dating to the Second Dynasty (28th century BC). Egyptian hieroglyphs developed into a mature writing system used for monumental inscription in the classical language of the Middle Kingdom period; during this period, the system made use of about 900 distinct signs. The use of this writing system continued through the New Kingdom and Late Period, and on into the Persian and Ptolemaic periods. Late survivals of hieroglyphic use are found well into the Roman period, extending into the 4th century AD. With the final closing of pagan temples in the 5th century, knowledge of hieroglyphic writing was lost. Although attempts were made, the script remained undeciphered throughout the Middle Ages and the early modern period. The decipherment of hieroglyphic writing would only be accomplished in the 1820s by Jean-François Champollion, with the help of the Rosetta Stone. The word hieroglyph comes from the Greek adjective ἱερογλυφικός (hieroglyphikos), a compound of ἱερός (hierós 'sacred') and γλύφω (glýphō 'Ι carve, engrave'; see glyph). The glyphs themselves since the Ptolemaic period were called τὰ ἱερογλυφικὰ [γράμματα] (tà hieroglyphikà [grámmata]) "the sacred engraved letters", the Greek counterpart to the Egyptian expression of mdw.w-nṯr "god's words". Greek ἱερογλυφός meant "a carver of hieroglyphs". 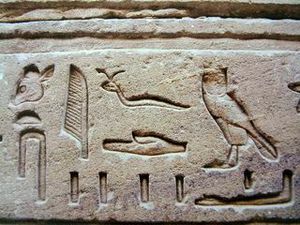 In English, hieroglyph as a noun is recorded from 1590, originally short for nominalised hieroglyphic (1580s, with a plural hieroglyphics), from adjectival use (hieroglyphic character). 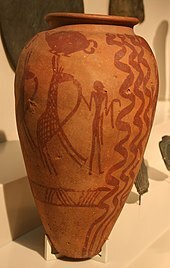 Paintings with symbols on Naqada II pottery. 3500-3200 BC. Hieroglyphs may have emerged from the preliterate artistic traditions of Egypt. For example, symbols on Gerzean pottery from c. 4000 BC have been argued to resemble hieroglyphic writing. Designs on some of the labels or token from Abydos, carbon-dated to circa 3400-3200 BC and among the earliest form of writing in Egypt. They are similar to contemporary clay tags from Uruk, Mesopotamia. Proto-hieroglyphic symbol systems develop in the second half of the 4th millennium BC, such as the clay labels of a Predynastic ruler called "Scorpion I" (Naqada IIIA period, c. 33rd century BC) recovered at Abydos (modern Umm el-Qa'ab) in 1998 or the Narmer Palette (c. 31st century BC). The first full sentence written in mature hieroglyphs so far discovered was found on a seal impression found in the tomb of Seth-Peribsen at Umm el-Qa'ab, which dates from the Second Dynasty (28th or 27th century BC). There are around 800 hieroglyphs dating back to the Old Kingdom, Middle Kingdom and New Kingdom Eras. By the Greco-Roman period, there are more than 5,000. 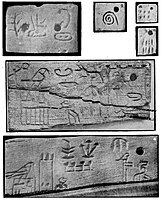 Geoffrey Sampson stated that Egyptian hieroglyphs "came into existence a little after Sumerian script, and, probably [were], invented under the influence of the latter", and that it is "probable that the general idea of expressing words of a language in writing was brought to Egypt from Sumerian Mesopotamia". There are many instances of early Egypt-Mesopotamia relations, but given the lack of direct evidence for the transfer of writing, "no definitive determination has been made as to the origin of hieroglyphics in ancient Egypt". Instead, it is pointed out and held that "the evidence for such direct influence remains flimsy” and that “a very credible argument can also be made for the independent development of writing in Egypt..." Since the 1990s, the discoveries of glyphs at Abydos, dated to between 3400 and 3200 BCE, may challenge the classical notion according to which the Mesopotamian symbol system predates the Egyptian one, although Egyptian writing does make a sudden apparition at that time, while on the contrary Mesopotamia has an evolutionnary history of sign usage in tokens dating back to circa 8000 BCE. Hieroglyphs consist of three kinds of glyphs: phonetic glyphs, including single-consonant characters that function like an alphabet; logographs, representing morphemes; and determinatives, which narrow down the meaning of logographic or phonetic words. As writing developed and became more widespread among the Egyptian people, simplified glyph forms developed, resulting in the hieratic (priestly) and demotic (popular) scripts. These variants were also more suited than hieroglyphs for use on papyrus. Hieroglyphic writing was not, however, eclipsed, but existed alongside the other forms, especially in monumental and other formal writing. The Rosetta Stone contains three parallel scripts – hieroglyphic, demotic, and Greek. Hieroglyphs continued to be used under Persian rule (intermittent in the 6th and 5th centuries BC), and after Alexander the Great's conquest of Egypt, during the ensuing Ptolemaic and Roman periods. It appears that the misleading quality of comments from Greek and Roman writers about hieroglyphs came about, at least in part, as a response to the changed political situation. Some believed that hieroglyphs may have functioned as a way to distinguish 'true Egyptians' from some of the foreign conquerors. Another reason may be the refusal to tackle a foreign culture on its own terms, which characterized Greco-Roman approaches to Egyptian culture generally. Having learned that hieroglyphs were sacred writing, Greco-Roman authors imagined the complex but rational system as an allegorical, even magical, system transmitting secret, mystical knowledge. By the 4th century, few Egyptians were capable of reading hieroglyphs, and the "myth of allegorical hieroglyphs" was ascendant. Monumental use of hieroglyphs ceased after the closing of all non-Christian temples in 391 by the Roman Emperor Theodosius I; the last known inscription is from Philae, known as the Graffito of Esmet-Akhom, from 394. The Hieroglyphica of Horapollo (c. 5th century) appears to retain some genuine knowledge about the writing system. It offers an explanation of close to 200 signs. 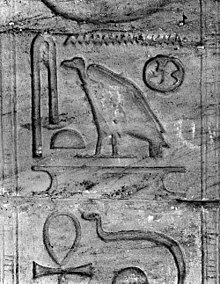 Some are identified correctly, such as the "goose" hieroglyph (zꜣ) representing the word for "son". Knowledge of the hieroglyphs had been lost completely by the medieval period. Early attempts at decipherment are due to Dhul-Nun al-Misri and Ibn Wahshiyya (9th and 10th century, respectively). All medieval and early modern attempts were hampered by the fundamental assumption that hieroglyphs recorded ideas and not the sounds of the language. As no bilingual texts were available, any such symbolic 'translation' could be proposed without the possibility of verification. It wasn't until Athanasius Kircher in the mid 17th century that scholars began to think the hieroglyphs might also represent sounds. Kircher was familiar with Coptic, and thought that it might be the key to deciphering the hieroglyphs, but was held back by a belief in the mystical nature of the symbols. It is a complex system, writing figurative, symbolic, and phonetic all at once, in the same text, the same phrase, I would almost say in the same word. Hieroglyphs survive today in two forms: directly, through half a dozen Demotic glyphs added to the Greek alphabet when writing Coptic; and indirectly, as the inspiration for the original alphabet that was ancestral to nearly every other alphabet ever used, including the Latin alphabet. Visually, hieroglyphs are all more or less figurative: they represent real or illusional elements, sometimes stylized and simplified, but all generally perfectly recognizable in form. However, the same sign can, according to context, be interpreted in diverse ways: as a phonogram (phonetic reading), as a logogram, or as an ideogram (semagram; "determinative") (semantic reading). The determinative was not read as a phonetic constituent, but facilitated understanding by differentiating the word from its homophones. Most non-determinative hieroglyphic signs are phonetic in nature, meaning that the sign is read independently of its visual characteristics (according to the rebus principle where, for example, the picture of an eye could stand for the English words eye and I [the first person pronoun]). This picture of an eye is called a phonogram of the word, 'I'. Phonograms formed with one consonant are called uniliteral signs; with two consonants, biliteral signs; with three, triliteral signs. Twenty-four uniliteral signs make up the so-called hieroglyphic alphabet. Egyptian hieroglyphic writing does not normally indicate vowels, unlike cuneiform, and for that reason has been labelled by some an abjad alphabet, i.e., an alphabet without vowels. , two half-rings opening to the left), sometimes replaced by the digit '3', is the Egyptian alef). As in the Arabic script, not all vowels were written in Egyptian hieroglyphs; it is debatable whether vowels were written at all. Possibly, as with Arabic, the semivowels /w/ and /j/ (as in English W and Y) could double as the vowels /u/ and /i/. In modern transcriptions, an e is added between consonants to aid in their pronunciation. For example, nfr "good" is typically written nefer. This does not reflect Egyptian vowels, which are obscure, but is merely a modern convention. Likewise, the ꜣ and ʾ are commonly transliterated as a, as in Ra. Hieroglyphs are written from right to left, from left to right, or from top to bottom, the usual direction being from right to left (although, for convenience, modern texts are often normalized into left-to-right order). The reader must consider the direction in which the asymmetrical hieroglyphs are turned in order to determine the proper reading order. For example, when human and animal hieroglyphs face to the left (i.e., they look left), they must be read from left to right, and vice versa, the idea being that the hieroglyphs face the beginning of the line. As in many ancient writing systems, words are not separated by blanks or by punctuation marks. However, certain hieroglyphs appear particularly common only at the end of words, making it possible to readily distinguish words. Hieroglyphs at Amada, at temple founded by Tuthmosis III. The Egyptian hieroglyphic script contained 24 uniliterals (symbols that stood for single consonants, much like letters in English). 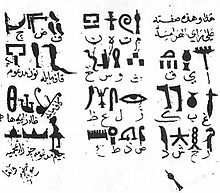 It would have been possible to write all Egyptian words in the manner of these signs, but the Egyptians never did so and never simplified their complex writing into a true alphabet. Each uniliteral glyph once had a unique reading, but several of these fell together as Old Egyptian developed into Middle Egyptian. For example, the folded-cloth glyph seems to have been originally an /s/ and the door-bolt glyph a /θ/ sound, but these both came to be pronounced /s/, as the /θ/ sound was lost. A few uniliterals first appear in Middle Egyptian texts. Besides the uniliteral glyphs, there are also the biliteral and triliteral signs, to represent a specific sequence of two or three consonants, consonants and vowels, and a few as vowel combinations only, in the language. However, it is considerably more common to add to that triliteral, the uniliterals for f and r. The word can thus be written as nfr+f+r, but one still reads it merely as nfr. The two alphabetic characters are adding clarity to the spelling of the preceding triliteral hieroglyph. – md +d +w (the complementary d is placed after the sign) → it reads mdw, meaning "tongue". – ḫ +p +ḫpr +r +j (the four complementaries frame the triliteral sign of the scarab beetle) → it reads ḫpr.j, meaning the name "Khepri", with the final glyph being the determinative for 'ruler or god'. – ḥtm (written ḥ +ḥtm +t, with the determinative of the flying bird), meaning "to disappear". Comparative evolution from pictograms to abstract shapes, in cuneiform, Egyptian and Chinese characters. Besides a phonetic interpretation, characters can also be read for their meaning: in this instance, logograms are being spoken (or ideograms) and semagrams (the latter are also called determinatives). – dšr, meaning "flamingo"; the corresponding phonogram means "red" and the bird is associated by metonymy with this color. Determinatives or semagrams (semantic symbols specifying meaning) are placed at the end of a word. These mute characters serve to clarify what the word is about, as homophonic glyphs are common. If a similar procedure existed in English, words with the same spelling would be followed by an indicator that would not be read, but which would fine-tune the meaning: "retort [chemistry]" and "retort [rhetoric]" would thus be distinguished. is used to define "books" but also abstract ideas. The determinative of the plural is a shortcut to signal three occurrences of the word, that is to say, its plural (since the Egyptian language had a dual, sometimes indicated by two strokes). This special character is explained below. All these words have a meliorative connotation: "good, beautiful, perfect". The Concise Dictionary of Middle Egyptian by Raymond A. Faulkner, gives some twenty words that are read nfr or which are formed from this word. A filling stroke is a character indicating the end of a quadrat that would otherwise be incomplete. Some signs are the contraction of several others. These signs have, however, a function and existence of their own: for example, a forearm where the hand holds a scepter is used as a determinative for words meaning "to direct, to drive" and their derivatives. The doubling of a sign indicates its dual; the tripling of a sign indicates its plural. Errors of omission in the drawing of signs, which are much more problematic when the writing is cursive (hieratic) writing, but especially demotic, where the schematization of the signs is extreme. However, many of these apparent spelling errors constitute an issue of chronology. Spelling and standards varied over time, so the writing of a word during the Old Kingdom might be considerably different during the New Kingdom. Furthermore, the Egyptians were perfectly content to include older orthography ("historical spelling") alongside newer practices, as though it were acceptable in English to use archaic spellings in modern texts. Most often, ancient "spelling errors" are simply misinterpretations of context. Today, hieroglyphicists use numerous cataloguing systems (notably the Manuel de Codage and Gardiner's Sign List) to clarify the presence of determinatives, ideograms, and other ambiguous signs in transliteration. though ii is considered a single letter and transliterated y. Here, the 'house' hieroglyph works as a logogram: it represents the word with a single sign. The vertical stroke below the hieroglyph is a common way of indicating that a glyph is working as a logogram. Here, the 'house' glyph stands for the consonants pr. The 'mouth' glyph below it is a phonetic complement: it is read as r, reinforcing the phonetic reading of pr. The third hieroglyph is a determinative: it is an ideogram for verbs of motion that gives the reader an idea of the meaning of the word. Egyptian hieroglyphs were added to the Unicode Standard in October 2009 with the release of version 5.2 which introduced the Egyptian Hieroglyphs block (U+13000–U+1342F) with 1,071 defined characters. As of July 2013[update], four fonts, Aegyptus, NewGardiner, Noto Sans Egyptian Hieroglyphs and JSeshFont support this range. Another font, Segoe UI Historic, comes bundled with Windows 10 and also contains glyphs for the Egyptian Hieroglyphs block (excluding U+130B8–130BA). ^ a b c Richard Mattessich (2002). "The oldest writings, and inventory tags of Egypt". Accounting Historians Journal. 29 (1): 195–208. JSTOR 40698264. ^ Allen, James P. (2010). Middle Egyptian: An Introduction to the Language and Culture of Hieroglyphs. Cambridge University Press. p. 2. ISBN 9781139486354. ^ a b c d e f g Allen, James P. (2010). Middle Egyptian: An Introduction to the Language and Culture of Hieroglyphs. Cambridge University Press. p. 8. ISBN 9781139486354. ^ a b There were about 1,000 graphemes in the Old Kingdom period, reduced to around 750 to 850 in the classical language of the Middle Kingdom, but inflated to the order of some 5,000 signs in the Ptolemaic period. Antonio Loprieno, Ancient Egyptian: A Linguistic Introduction (Cambridge: Cambridge UP, 1995), p. 12. ^ The standard inventory of characters used in Egyptology is Gardiner's sign list (1928–1953). A.H. Gardiner (1928), Catalogue of the Egyptian hieroglyphic printing type, from matrices owned and controlled by Dr. Alan Gardiner, "Additions to the new hieroglyphic fount (1928)", in The Journal of Egyptian Archaeology 15 (1929), p. 95; , "Additions to the new hieroglyphic fount (1931)", in The Journal of Egyptian Archaeology 17 (1931), pp. 245-247; A.H. Gardiner , "Supplement to the catalogue of the Egyptian hieroglyphic printing type, showing acquisitions to December 1953" (1953). Unicode Egyptian Hieroglyphs as of version 5.2 (2009) assigned 1,070 Unicode characters. ^ Michael C. Howard (2012). Transnationalism in Ancient and Medieval Societies. P. 23. ^ Antonio Loprieno, Ancient Egyptian: A Linguistic Introduction (Cambridge: Cambridge UP, 1995), p. 11. ^ "Hieroglyphic | Definition of Hieroglyphic by Merriam-Webster". Retrieved 2016-08-27. ^ Scarre, Chris; Fagan, Brian M. (2016). Ancient Civilizations. Routledge. p. 106. ISBN 9781317296089. ^ a b "The seal impressions, from various tombs, date even further back, to 3400 B.C. These dates challenge the commonly held belief that early logographs, pictographic symbols representing a specific place, object, or quantity, first evolved into more complex phonetic symbols in Mesopotamia." Mitchell, Larkin. "Earliest Egyptian Glyphs". Archaeology. Archaeological Institute of America. Retrieved 29 February 2012. ^ Conference, William Foxwell Albright Centennial (1996). The Study of the Ancient Near East in the Twenty-first Century: The William Foxwell Albright Centennial Conference. Eisenbrauns. p. -24-25. ISBN 9780931464966. ^ Geoffrey Sampson (1 January 1990). Writing Systems: A Linguistic Introduction. Stanford University Press. pp. 78–. ISBN 978-0-8047-1756-4. Retrieved 31 October 2011. ^ Geoffrey W. Bromiley (June 1995). The international standard Bible encyclopedia. Wm. B. Eerdmans Publishing. pp. 1150–. ISBN 978-0-8028-3784-4. Retrieved 31 October 2011. ^ Iorwerth Eiddon Stephen Edwards, et al., The Cambridge Ancient History (3d ed. 1970) pp. 43–44. ^ Robert E. Krebs; Carolyn A. Krebs (December 2003). Groundbreaking scientific experiments, inventions, and discoveries of the ancient world. Greenwood Publishing Group. pp. 91–. ISBN 978-0-313-31342-4. Retrieved 31 October 2011. ^ Simson Najovits, Egypt, Trunk of the Tree: A Modern Survey of an Ancient Land, Algora Publishing, 2004, pp. 55–56. ^ Ahmed ibn 'Ali ibn al Mukhtar ibn 'Abd al Karim (called Ibn Wahshiyah) (1806). Ancient alphabets & hieroglyphic characters explained: with an account of the Egyptian priests, their classes, initiation time, & sacrifices by the aztecs and their birds, in the Arabic language. W. Bulmer & co. Retrieved 31 October 2011. ^ Tabula Aegyptiaca hieroglyphicis exornata. Acta Eruditorum. Leipzig. 1714. p. 127. ^ Gardiner, Sir Alan H. (1973). Egyptian Grammar. Griffith Institute. ISBN 978-0-900416-35-4. Adkins, Lesley; Adkins, Roy (2000). The Keys of Egypt: The Obsession to Decipher Egyptian Hieroglyphs. HarperCollins Publishers. ISBN 978-0-06-019439-0. Allen, James P. (1999). Middle Egyptian: An Introduction to the Language and Culture of Hieroglyphs. Cambridge University Press. ISBN 978-0-521-77483-3. Collier, Mark & Bill Manley (1998). How to Read Egyptian Hieroglyphs: a step-by-step guide to teach yourself. British Museum Press. ISBN 978-0-7141-1910-6. Selden, Daniel L. (2013). Hieroglyphic Egyptian: An Introduction to the Language and Literature of the Middle Kingdom. University of California Press. ISBN 978-0-520-27546-1. Faulkner, Raymond O. (1962). Concise Dictionary of Middle Egyptian. Griffith Institute. ISBN 978-0-900416-32-3. Gardiner, Sir Alan H. (1957). Egyptian Grammar: Being an Introduction to the Study of Hieroglyphs, 3rd ed. The Griffith Institute. Hill, Marsha (2007). Gifts for the gods: images from Egyptian temples. New York: The Metropolitan Museum of Art. ISBN 9781588392312. Kamrin, Janice (2004). Ancient Egyptian Hieroglyphs: A Practical Guide. Harry N. Abrams, Inc. ISBN 978-0-8109-4961-4. McDonald, Angela. Write Your Own Egyptian Hieroglyphs. Berkeley: University of California Press, 2007 (paperback, ISBN 0-520-25235-7). Look up hieroglyph in Wiktionary, the free dictionary. Wikimedia Commons has media related to Egyptian hieroglyphs.